If the type of domestic property you live in is suitable, it is perfectly legal to have a bonfire on your land and, contrary to popular belief, there are no restrictions as to what time of the day or day of the week you can have it on. There is, however, firm legislation in place which you must comply with to ensure that your bonfire does not contravene the Environmental Protection Act. In addition to the legislation, it’s also important that you consider how the bonfire might affect your neighbours. While the law does not restrict you from doing so, it would be highly inconsiderate to light a bonfire in the middle of the night. As a general guideline, don’t light your bonfire any later than one hour before dusk, and if possible do it in the morning or early evening. You need to think carefully about where in your garden you're going to place your bonfire. Not only do you need to consider your neighbours, but any kind of fire can be extremely dangerous if not managed properly. 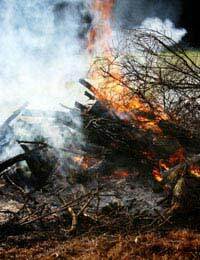 Keep any bonfire well out of the way of windows, trees, fences, hedges and other combustible materials. Even in the summer months, when there are lots of green leaves around, it’s easy to forget that they are simply light covering for a lot of dry wood and, should an ivy bush catch fire, for example, one that grows along the side of a fence reaching right to your house, it’s amazing how rapidly that can take hold and spread. It’s common courtesy to let those neighbours who might be affected by the smoke know when you intend to have the bonfire. Obviously, not everybody has the same day for doing their washing and hanging it out on the line or inviting guests around for a barbecue, but by letting them know in advance, your neighbours can plan washing days and outdoor activities accordingly. While on the subject of barbecues or using other smoke-causing devices such as a Wood Burning Stove, the same common courtesy rules should apply if you think you are going to cause excessive smoke problems. First, try to have as few bonfires as possible. These days, and with the encouragement to recycle, there is far less need to burn garden rubbish than there may have been a few years ago. Recycling bins are often provided for garden waste and many gardeners will use much of the stuff that they may have previously burned and use it as compost. Don’t include any wet or green materials on your bonfire as that will just cause excess smoke. For safety purposes and to reduce annoyance potential, it's best to burn a small bonfire and then adding to it as opposed to making one great big bonfire. Keep a hosepipe handy or have buckets of water already prepared in case the fire gets out of control, and never leave a bonfire unattended. You should not burn anything which is likely to cause excessive and pungent black smoke. For example, rubber tyres and plastic containers do not belong on a bonfire. You should not attempt to light a bonfire when it’s a windy day, as wind will blow the smoke further, causing annoyance to even more of your neighbours. If a neighbour is burning a bonfire which is causing a nuisance, you should go round to their house and ask them politely to extinguish it or if they could do anything to reduce its effects. Quite often, they are so engrossed in what they’ve got to burn and get rid of that they can be pretty oblivious to the effects the bonfire is having on nearby residents. However, if they ignore your request, you can contact your local authority’s environmental health department who will write to the neighbour, and include the relevant legislation about what they can and cannot do. Further legal action can be taken against them if they continue to flout the law. Keeping a written log of dates and times when the problems arise and taking some footage of the effects of a neighbour’s bonfire if you have a camera or, better still, a camcorder, will often help to enable your local authority to prosecute them more quickly if they are breaching the law. Generally speaking, however, there are far fewer reasons for anybody to be having to burn rubbish on a bonfire in their garden these days. Waste can be often be recycled or disposed of in other ways so, if you are thinking of having a bonfire, consider the neighbours and think of less damaging ways in which you might be able to dispose of certain kinds of waste. I live in an area which has become to burning capital of the UK. People around this area are constantly burning, so far it stand at eight days of solid burning starting last Saturday (23/3/19). One of the fires as been burning since Monday(horse bedding from a stable) and there have been two others at it also. I am so fed up with the selfish self centred attitude of people in the uk and lack of common sense by the local council which is making living in this area unbearable nowadays. The house next to me is a rental property, and the landlord only rents to East Europeans. Right next to our party fence, which belongs to me, some tenant built some kind of cooking pit, which every tenant has used ever since, to burn all kinds of stuff. The smoke is often thick, black and foul. I always have to have windows closed, even in summer. They have BBQs on it all year round, even in the middle of winter. I'm sick and tired of it all. Where I rent the son next door is actually bringing waste to the property and piling it into a bonfire and setting fire to it regularly There are all kinds of plastics and mattresses being burnt. How can it be legal? Your local environmental health department will be able to take action over this; it sounds like your neighbour is operating some kind of business. Where I rent the son next door is actually bringing waste to the property and piling it into a bonfire and setting fire to it regularlyThere are all kinds of plastics and mattresses being burnt. How can it be legal? I have had the police around to me tonight because I am at the end of my teather with my neighbour constantly burning wood in his fire pit...in this hot hot weather I am unable to open my Windows as my rooms stink of smoke & the fumes effect my chest...how is it allowed that they can impact my peaceful living that way. I have thrown bucketfuls of water onto their garden & have had the police called on me, I readily admitted to this as I want it documented that I can't cope with this anymore. No one does anything & stupidly Environmental health say it's legal and therefore ok? I'm not sure what I'd be capable of next? There is a contradiction in this article that lies at the heart of the matter. You write: "there are no restrictions as to what time of the day or day of the week you can have it on. ". Then you write: "firm legislation in place which you must comply with to ensure that your bonfire does not contravene the Environmental Protection Act." But you don't explain what that legislation is in relation to bonfires, if anything at all. You talk about "consideration" and "should" and "shouldn't", but what does the actual Law say? It seems to say nothing about garden bonfires. In a comment, you talk about people being prosecuted for "breaching the law" but you already said there are no laws in relation to garden bonfires. I think there are laws inrelation to industrial strength bonfires and heavy industry smoke, but nothing stopping individuals having a bonfire 24/7 if they desire. People who are that inconsiderate, by definition, do not respond to "polite requests" to refrain from their selfish behaviour. So if after repeatedly having your house filled with smoke in the summer, you call Environmental Health, what exactly are they going to do? What law has the "bonfire ever day" neighbour broken? Surely without a law there is nothing at all to stop them? And that is the solution - there needs to be clear laws on this. Hours need to be stated. There is no reason to have a private garden bonfire after, say 9 pm. There should be a maximum duration, say 2 hours. There should be a legal maximum height etc. All of this would be easy to add to legislation and as society gets more greedy, selfishand inconsiderate as well as in Britain, highly overpopulated, would do so much to improve the quality of life. My neighbours, who are so close they have to put a ladder in our garden to clean their new extension, have “ made over” their garden and now have a fire pit. They buy the wood for the fire pit and use it nearly every night while the weather is hot. We are unable to enjoy our garden because of it and have been suffering terribly from smoke odour in our home to the point the I felt suffocated by it last night. I now have no option but to close all of our windows, in this heat, because we are now acquiring a smoke smell throughout our home on our soft furnishings. Neither my husband or I smoke and we both have health issues, I am on beta blockers for my heart. The pit is situated at the bottom of his garden which is about 15metres from my back door. I can’t believe that this new trend can just be allowed to ruin people’s lives like this. He als had a wood fire burner put in at great expense as it is a new build gas centrally heated house and buys wood to burn on that. The smell in my home is now upsetting me and my being overwhelmed by the smokey air in my bedroom last night is making me despair. What can I do about this? Can anyone advise me please, it’s now pretty unbareable. Are there any additional regulations about bonfires during a heatwave? Everyone’s grass is burnt and large fires have been documented in the news. Yet, our neighbour decided to have a bonfire last night when everyone’s windows were open and the ground is particularly vulnerable to catching fire. There is ash and smoke in everyone’s house, which is causing problems sleeping at night. A small fire truck came round. But did nothing. Environmental health may be able to take action in relation to this. My neighbour burns the straw / hay and manure from their chickens. Although to be fair there is hardly any smoke the fire creates awful fumes / smell. This smell carries on right in to the night as the fire smoulders rather than actually burns. This is done regularly once a fortnight, is this legal. She does leave a text to say she is having a bonfire the night before. But it still doesn't make it right does it? Is there any thing we can do about it? I understand how a bonfire is unpopular and annoying, however not every body has the ability to take garden waste to the local centre. I don't drive, I don't know anyone who does and I can't afford to pay somebody to collect my garden waste. I don't see why I cannot use a small incinerator bin early morning. As long as I have safety precautions, inform neighbours, keep it small and only burn dry garden waste. As long as you check the wind direction and that your neighbours do not have washing out, an occasional small bonfire may be your only option. In the UK however there are not many councils that don't take garden waste as part of the roadside refuse collection. Whereabouts do you live? My Neighbour is constantly lighting fires and the smoke is driving me nuts.I'm just waiting for an opportunity to throw paint stripper on his car that can't be proven it was me. A neighbour regularly has a bonfire burning used adult nappies. The smell is appalling. It lasts for hours.All the other neighbours have to shut their windows and doors. Is the burning of such items illegal and if so then what is the proper way to dispose of them? I agree with others that these irresponsible people who light any kind of fire and cause a smoke nuisance should be banned from doing such things. Day after day in the summer someone somewhere lights a garden bonfire in Leyton where I live. Its about time this government completely banned back garden burning. What do these people think they have dustbins for. I also have to have a machine to pump oxygen to me during the night. I too have endured Bonfires on the hottest day of the year so far In 2 weeks my neighbour has had 5 bonfires. I suffer from lung problems as well as having 2 children. Windows have to be sealed shut, with no air to breathe and the temperature one night was 28c unbearable. Tonight I decided to sit in the garden and eat outside with my children resulting in retreating indoors during mid meal due to yet another fire starting . The fires are huge spanning at least 15 feet across. One morning I awoke to my lawn being completely covered in ash, it looked like there had been a volcanoe. The neighbours have put up a new fence, hence burning old fence as well as green hedge growth, when I complained, their reply was I bet your enjoying the new fence though. Complete inconsiderate , brain dead Morons!! Even when they light the fires they leave them burning all night and it's still burning in the morning . These people smoke like chimneys let their kids play near the fires and think nothing of inhaling thick smoke into their lungs. Their house must be putrid with the smell of smoke. When I mentioned how all the smoke blew into my garden and into my house !! His answer was I cant help the Wind can I ? Duh !!! Don't light it when it's windy then! Looking out the window today I can see another pile ready to go , the pile looks about 25 feet wide and 6 foot tall . So you lot be thankful you don't have my neighbours . People who burn of rather than take their stuff to the tip are basically lazy, inconsiderate and stupid. Hi Well I would much prefer not to have a bonfire.I own a van, which is not for commercial reasons, and I've obtained a permit from the local council to be able to take domestic rubbish to the tip. The first time I did that, they waved me in gladly, I tipped all the rubbish into it's corresponding area of the recycling facility and went to leave.Met as I was with a barrier on the exit I went to the window to ask for it to be raised and was presented with a £105 bill, which if not paid would lead to my van being seized.Apparently the 'permit' I got from the council was to give me access not for to cover costs. However, had I loaded all the rubbish into a car it would not be chargeable. Now we are renovating the house there is much more rubbish.I called the council and asked what they suggested and other than paying hundreds of pounds, the only option is to burn it. All I can say is had I won the lottery I would gladly pay for the disposal, but I haven't and since I only own the van - you guessed it I'm an unpopular neighbour. Thanks, that's off my chest but not any of my neighbours, here's hoping they read it. We live in the country next to a 'farm' which is really now only used for horses and a large barn for storing stuff from commercial and residential clearances. Anything he can't sell he burns on the land next to our cottage, which we rent. The fumes and thick, black and noxious. I have evidence that he is burning commercial waste including rubber, metal, fridges etc. Despite this the environmental health team at my local council say he is not doing anything wrong or breaking any bylaws. Milton Keynes council's website states "toxic fumes from any bonfire you light will affect other people and will almost certainly constitute a Statutory Nuisance under the Environmental Protection Act 1990 on the grounds that the fumes are "injurious to health". Unfortunately we don't live in the Milton Keynes area and have to put up with our nuisance farmer neighbour and his odious bonfire habits. The bonfires are so large that they are often burning overnight and smouldering the next day - the Fire Service state that any bonfires should not be left unattended - he certainly doesn't attend to his. I'm one of those who has bonfires. I cut down old Leyland trees from my garden. My local council takes garden refuse, but not logs. They define a log as anything more than half an inch in diameter. So I was left with plenty of logs. Although it means that I have countless trips to the local tip with all the logs I have, I would do so. But as the "local" tip is some 10 miles away, that's absolutely ludicrous. Which means the only way to get rid of these logs is to burn them.I live in a house at the end of a street. I asked my next door neighbour if he had any objections to me having some bonfires. He was fine with it. Some 20 minutes after I started the bonfire, there was a man shouting from his back garden asking me to put it out - and he was about 50 yards away in the next street! I was burning only logs - no green leaves - just logs. There was no more smoke then would come from a barbecue.He came to my house, gave me the usual "bonfires are illegal" business (not true). But as he was younger and bigger than me, and looked the type not to be argued with, I put the fire out as I didn't want to find my car damaged the next day. So I'm left with the logs. So the neighbor behind my house has a garden fire every week. I think it might be garden waste due the car getting coverd in ash and what looks like grass and hedge trimmings. The most annoying thing is the kids trampoline gets covered in ash and smoke is everywhere the weather is really hot so we have to close all the windows. Is this a case to be reported? I'm one of those who has bonfires.I cut down old Leyland trees from my garden.My local council takes garden refuse, but not logs.They define a log as anything more than half an inch in diameter.So I was left with plenty of logs.Although it means that I have countless trips to the local tip with all the logs I have, I would do so.But as the "local" tip is some 10 miles away, that's absolutely ludicrous.Which means the only way to get rid of these logs is to burn them. I live in a house at the end of a street.I asked my next door neighbour if he had any objections to me having some bonfires.He was fine with it.Some 20 minutes after I started the bonfire, there was a man shouting from his back garden asking me to put it out - and he was about 50 yards away in the next street!I was burning only logs - no green leaves - just logs.There was no more smoke then would come from a barbecue. He came to my house, gave me the usual "bonfires are illegal" business (not true).But as he was younger and bigger than me, and looked the type not to be argued with, I put the fire out as I didn't want to find my car damaged the next day.So I'm left with the logs.